I hope that you all are doing well! I've been feeling really beat down lately and it's starting to affect a lot of things. I've not really wanted to do anything. I've been planning posts about but just haven't really been up too putting them up. Super lame! So I am very sorry about that! I'm definitely going to be working harder to get my regular schedule back! I'm sorry for complaining. 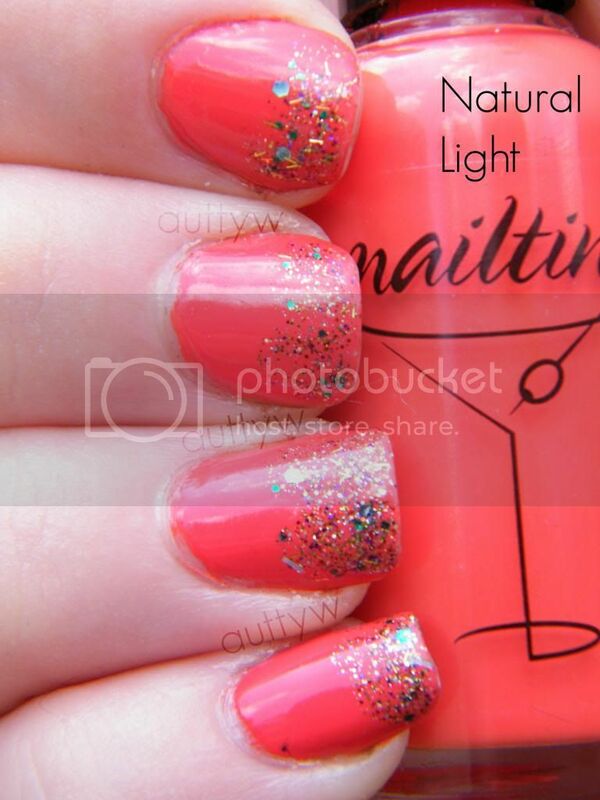 I got Nailtini's Mai Tai from July's Ipsy bag and in the bottle I wasn't sure if I was going to like it or not. In the bottle is really reminded me of tomato soup with milk in it. 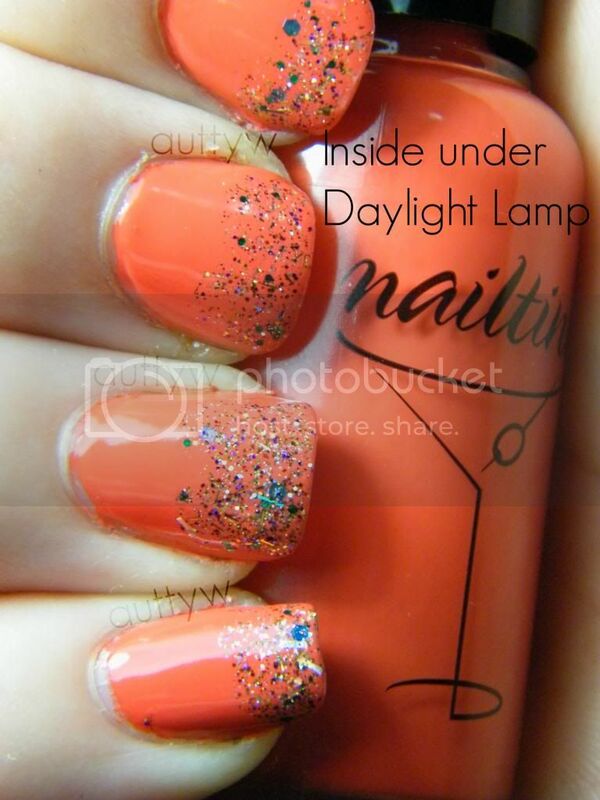 Let me just tell you, I am SO GLAD that I decided to give this a try and not let it sit in my nail polish box! I want to make a note that this photographs differently under different lighting. 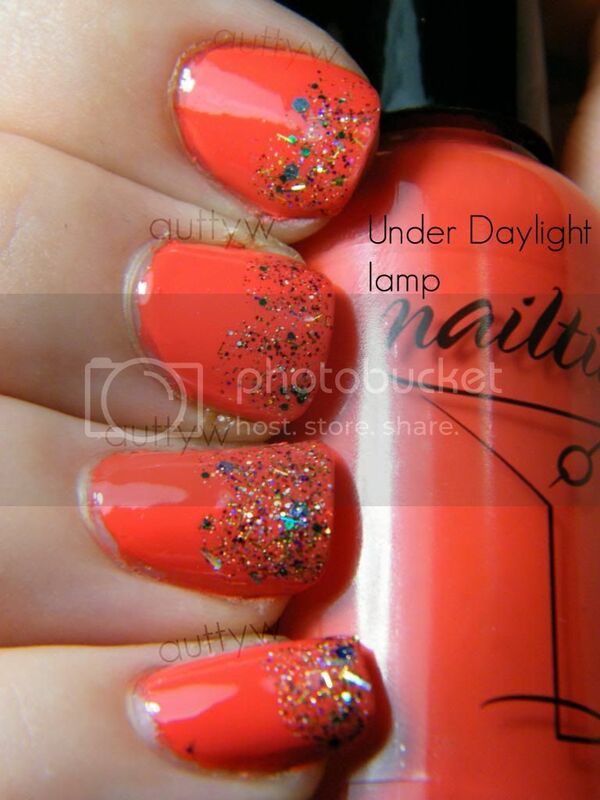 I have under my daylight lamp and in natural sunlight. Isn't this gorgeous!? It did stain my cuticles a little bit as you can tel in the picture. I will tell you that this is the farthest from color accurate. I didn't edit it because I wanted to show how it photographed under a daylight lamp. I honestly don't care that this photographed differently each time because it's still a gorgeous polish. I know you're probably like uhm 'scuse me Autumn?! What the hell is the name of the glitter?! No? You probably don't care :P (kidding..maybe) Anyhoodle, it's a polish that I made back when I was going to make polishes. Unfortunately my allergies got the best of me and I had to stop. There's only one other person who has a bottle of it. That's really pretty! I don't know why I don't do glitter tips more often.